Description: This is a moderate 9.6 mile shuttle hike. If you like majestic views this is your hike. There are at least 10 outstanding overlooks in this section of the North Fork Mt. Trail. I approximate 10 because there are several other spots where a quick bushwhack to the ridge will bring you to even more breath-taking views. Both trailheads are on CR28 - Smoke Hole Rd. Trail Notes: All trails are blazed with blue plastic diamonds. Intersections are posted. Mileage on the map marks the distance between trail junctions and/or overlooks (camera icons). Redman Run Trail (TR 507) begins as forest road 214. It starts heading due west but quickly turns north, climbing easily and obliquely up the back of the mountain. At 0.65 turn left onto FR214A. In another 0.24 miles the trail leaves on a footpath to the right of the forest road. Follow the blazes. This is the hardest segment of the hike but is short-lived. 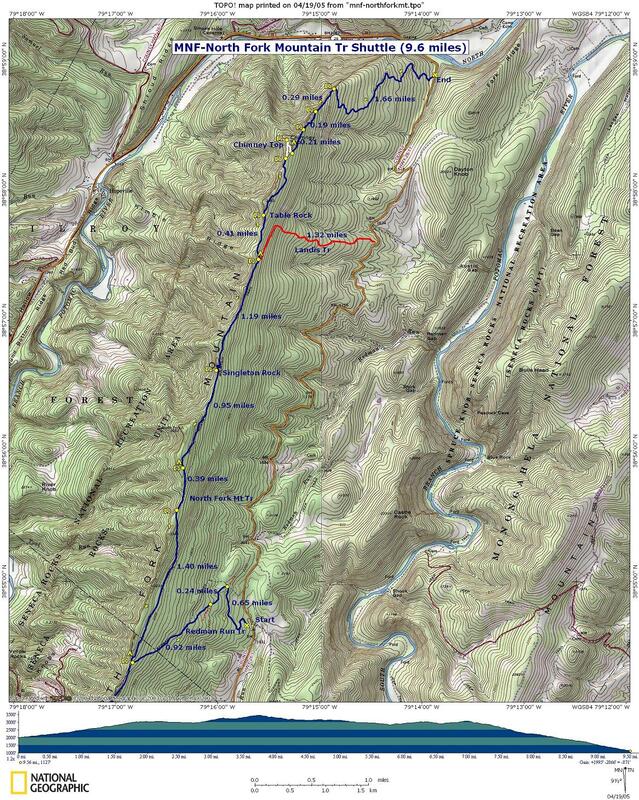 Climb another 0.92 miles to the intersection with the North Fork Mountain Trail (TR 507). Walk across a campsite to a rock ledge for your first view. Continue North (right turn from Redman Run Trail) for 1.4 miles to the next overlook. There will be an a sketchy footpath on the left through a Mountain Laurel/pitch pine thicket. There might me a small, obviously scuffed log lying across the trail. You�re at the second overlook. Besides a view of the Allegheny front to the west, if you look north you�ll see some of the �Chimney Rocks� you�ve been walking behind. Continue north on North Fork Mt Trail for another 0.39 miles to another campsite on the left. 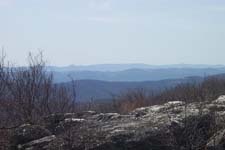 More views can be had here by walking through open woods to the ridge. After climbing an additional 0.95 miles (You will know you�re close to the top when you pass through some nice mountain top Rhododendrons.) come to an outstanding rock outcrop to the left. I named it Singleton Rock after the gentleman who showed me how to get on top of the rock. There are breaks in the chimneys allowing you to look out into the valley and the opposite ridge. For a more grandiose view follow a trail that, for the most part, hugs the back of the outcrop to a point where you can step up onto the top of the chimneys. Walk back towards where you originally stopped and take in this view. Return to the main trail and continue north. For the next 1.19 miles the trail is mostly flat as you walk across a saddle to the junction of the Landis trail on the right. Pass Landis Tr and continue straight on the North Fork Mt Trail and descend to avoid a posted Peregrine Falcon nesting area. As quickly as you descend you will change direction and climb back to the top of the ridge. 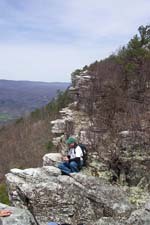 Look for a side trail that will take you out to an area I call �Table Rock� for obvious reasons. 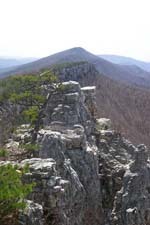 Besides views to the south and west you get an impressive view north of the focal point of the hike, Chimney Top. Continue north on The North Fork Mt Tr for about another 0.5 miles to a lesser overlook. As you leave the vista the main trail will slide down off of the ridge but a footpath will continue along and/or right behind it, close to the rocks. This is one of the side trails to Chimney Top. At some points it may look like the trail ends but a quick step up onto a large rock will put you back on it. Walk through some pitch pines and avoid the temptation to look out into the valley. At a sandy spot the trail makes a sharp left. It�s a matter of climbing up onto a rock outcrop to arrive at your destination. Another option is to pass this sketchy trail and continue a short distance to a more obvious trail marked by cairns. Turn left and climb until the trail seems to stop at a long rock. Step up onto the rock and connect with the previously discussed trail. When traveling north I like to take the first one in and the second trail out for obvious reasons. After taking in all the grandeur that the North Fork Valley has to offer, return to the side trail that goes back to the main trail. You can either go all the way back or look for the other trail that descends more quickly to the main trail. It is just beyond the pitch pines you walked through earlier and requires you to steep down off of the rocks to reach it. Regardless of which trail you take back to the North Fork Mountain trail, proceed north on it. At intervals of 0.21, 0.19 and 0.29 miles come to even more vistas. Down in the valley you can see Smoke Hole Caverns and the Town of Cabins. Looking north you can see New Creek Mountain. From there it is a relatively rapid descent, via switchbacks, to get back to your cars. Return at approximately 1.66 miles from the last overlook. Outing Critique: Thank you so much to MidAtlanticHikes.com for the great directions for this hike. We followed them exactly and they were great! As mentioned, if you like awesome overlooks and killer rock formations, this is a great hike! Starting at Redman Run Trail and then finishing at the North End makes for a nice 9.6 mile one-day hike that is not too strenuous... and it hits some of the best features and builds as it goes. First you see a really cool overlook, then a nice rock outcropping and view at the summit. 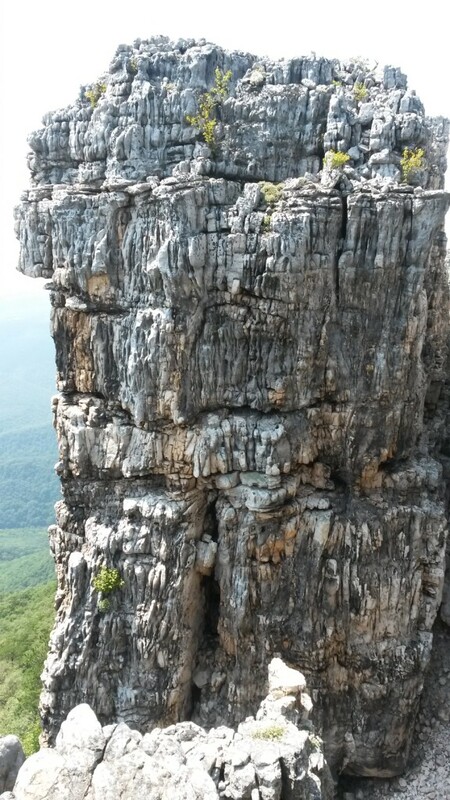 As you continue along, the Table Top overlook and then finally the Chimney Top are truly spectacular!! All the pictures in the world can't come close to what it's like. The trail itself is nice with only a few rocky sections. This is one of my favorite hikes I have ever done and is really a hidden gem. Go there and you will not be disappointed!! And the area is under 2.5 hours from DC. The local hotels are cheap too (Fort Hill Motel was clean and $60 a night!)... and Seneca Rocks is a great sister hike. We loved it so much I made a Rockumentary of our trip. An early start from Pittsburgh had me at the north trailhead by first light. It was pretty gloomy, but just bright enough to notice that the trees were clad in full fall finery. 50yds into the hike and a beautiful stand of trees stalled forward progress almost before I even got started. After regaining focus I headed upward on a consistent, but relatively gentle slope. The light improved steadily and I knew that it was going to be a glorious day. Not much happened until I crested the ridge. The views were quite spectacular. Fog still hung in the valley below thought it was burning away quite quickly. Shadows nestled in the various folds of Shroud Ridge, across the Potomac River valley. It was all quite peaceful. Well not completely peaceful: a goodly amount of elevation gain still remained. Thankfully though, it was all in the open now, and I didn't even notice the climb up to Chimney Top. I had initially thought that Id travel further along the ridge, but my camera developed various issues, so I decided that enough was enough and headed back down. A month earlier I had been stymied by camera problems and had had to cut my hike along North Fork Mountains ridge crest short. It was time for a return. Another early start (3:30am from the house) had me at the Landis Trail trailhead and on my way by 7:30am. I was immediately struck by the change in scenery: it seemed that fall had moved its magic from the trees to the ground. Leaves, leaves and more leaves. The trail was thick with crunchy goodness, at times ankle deep. In no time at all I was rolling around on the ground taking photos. Chestnut and Red Oak leaves, intermixed with beech (I believe) created pretty patterns and color contrasts. Quite heavenly. I reached the ridge crest and decided to head south since Chimney Rocks, which I had visited earlier, were just north of me. One spectacularly craggy viewpoint after another made an appearance (though none quite as nice as Chimney Top). Eventually, I reached the 3653ft North Fork high-point, where I turned around. We had a group of six do this hike from the south to north in early January. We started hiking Friday night around 9:30 pm once we got our vehicles situated. We shuttled ourselves. It was a clear night for the most part, and the snow cover of 2-4inches actually helped us navigate the trail. We hiked in about 6 miles before setting up camp. Temps were cold but normal for that time of year, (mid20's I recall.) Saturday morning, we woke up to partly cloudy skies and a great view on both sides of the ridge. As we hiked, we made our way past the glider launch and down to the mid-way parking lot. Then it started to rain, and then freezing rain. By this time we were almost out of water. I carried about 4 liters in, and the rest of us had various amounts. Our biggest mistake was hoping to rely on snow melt for our water source. (The rain melted the snow along the way.) The one really big drawback to this hike is that there is no water along this trail whatsoever. We almost made do with a couple of puddles near the top of the mountain by the tower, but I don't think that any of us were that desperate at that point. We trudged through Chimney Rocks and down to our vehicles after a 17+mile day. We originally were going to camp Saturday night, but with the freezing rain and no solid water source, we opted for the truck and a hotel in Franklin. Great trip overall, but I cannot emphasize enough, that you must pack in enough water or stash it midway to do the trip as there is no source along this ridge trail. What awesome views of the valley below on both sides most of the way. 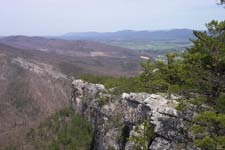 You can even see Seneca Rocks below you. Critique: I hiked all 24 miles of the trail from south to north in three days with a group of nice folks that I met on online forums Smiley, Mellew and Oh 7016. We all enjoyed the scenic overlooks and watching the birds fly in the thermals coming over the mountains. I highly recommend this trail cause of the great views and the beautiful campsites that are close to the trail. The only complaints I have is the weight of the extra water I had to carry, the last 2.5 miles of downhil and I wish the weather was a little less hot/humid, But at least it didn't rain on us during the trip. Critique: I thought this hike was outstanding and I've hiked and climbed in the Colorado Rockies, Grand Tetons, Mt. Rainier, and Canadian Rockies. We started at the Redman Run Trailhead in the late afternoon, hiked up the mountain a couple miles and found a great first camp for 5 backpackers. Very nice overlook into the valley below. 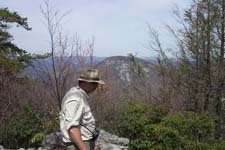 Next day we hiked north on the trail to Chimney Top. Another great overlook and view of the ridge looking back to the south. We found a camp near Chimney. Next day we hiked down the mountain a few miles to the Potomac for water. We were going to do a water filter pump fill up but found some cabins and housekeeping let us in to fill water bottles at an inside sink, which was very nice. We then turned around and hiked back up the mountain. This was by far the toughest part of the hike but very doable. I think a lot of people don't go down the mountain and turn around a go back up, but we thought what the heck, we have the time and it's great exercise. Also, some nice lookouts along the ridge looking to the north. This same day we hiked back to the first night's camp because we liked it so much and it had abundant room to spread out. Next morning we hiked down the mountain which took less than an hour back to the vehicle. We were back at the vehicle by 7am for the 12hr drive back to Grand Rapids, MI. So... we did 3 nights total and all in all had a great time. Overall based on our timeframe this was a very relaxing hike, it had some moments of pushing up the mountain but nothing too extreme. Maybe one slight negative was you could hear traffic sometimes on the ridge from the valley road below, but other than that, Beautiful country. Make sure to stop by the Seneca Rocks visitor center and check it out. Nice spot to get more details on trails and do some additional planning before hitting the trailhead and... the rocks are are nice to look at. Critique: We did the whole 24 miles. Used 3 cars. One in the middle with more food and water. This trail is like a fireworks display. 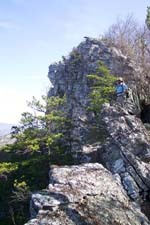 You start out on the South End with the little cliffs and then work your way up to Chimney Top which is the finale. Chimney Top is awesome. I called the big chimneys "the old men" cause the limestone looks wrinkled, and they almost seem to have some sort of consciousness or presence. Especially if you are there at sunset! Critique: We started from the top of North Mtn, near Judy Gap on Rt. 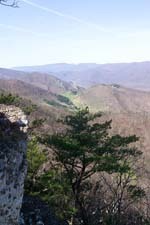 33, and hiked the whole trail, 23.8m, which came to end on Smoke Hole River Road (below Chimney Rocks). We started at 10am and got to Redmund Trail around 6:30pm - about 16m - and camped out for the night. The next day we left camp around 8am and finished up around 11am. In retrospect, I would have camped the first night at the water drop off - forest service road 79- near the big bend in the road. We decided to carry water with us instead, which is good and bad. Good b/c you don't spend so much time preparing for the hike when you get there, and bad b/c it's a lot of weight. Starting at the Redmund Trail, as outlined above, is the most scenic part of the trip. We hiked on the weekend after Labor Day and only saw one other human being on the trail (and that was close to the end). The hike is not difficult and maintains a level grade for much of the hike. There are only two spots, coming from the south, with strong upward grades. But neither of them are long, maybe .5 miles.